Well, before all the steamboats left the slip, I figured it was time I made the official announcement about something I’ve been tinkering with for some months, now. The Colony game. What happens when someone strikes out on their own on the fringes of civilization, and carves out a freehold of their very own. Clearing territory, attracting settlers, and starting your own economy. The Power game. The interactions between various factions and centers of power in an already-established nation, allowing the best to rise to the pinnacle of power. The Long game. 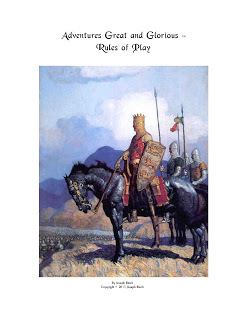 Rules for playing a game over successive generations of player characters, a la Pendragon. Full integration with Adventures Dark and Deep™ or any other similar game, allowing individual characters to integrate effortlessly with the factions of AGG, enabling a game master to create a massive combined game sharing the same campaign world, or simply have the events in one game influence the other. Tips and guidelines for running AGG as a purely PBEM game. Mass combat rules, intended for use with either miniature figures or with cardboard counters, to enable players to resolve battles the old fashioned way. Naval combat rules, intended to give a full measure of fantasy naval combat fully informed by history, again either with miniatures or cardboard counters. I know that this has been touted as “the end game”, but I’m not convinced that all that many campaigns end up on this trajectory. Thus, I envision it as a game unto itself. Something compatible with, but not necessary to, a more conventional game where you play a single character, rising in level and killing ever-more-awesome bad guys, thwarting their plans, and taking their treasure. Slick stuff, Joe! The first things that creeped into my head for comparison was Birthright, and Warmachine/Domain rules in the D&D Companion set. BR was always a tad more book keeping than Companion which was definitely nofrills. I preferred Companion because it was better integrated with the regular game. I assume that's what you're shooting for. I also like the Pendragon angle. The more historical-fiction feel the better. Alright, alright, NOT Birthright. Damn, I thought I was going to get the chance to break out the only old 2e books I had actually managed to acquire and attempt to use in my youthful DMing days. Good luck, count me in for any testing you need done for it! Looks like at least three similar games will be released around the same time. Excellent stuff, I can't wait to tinker with them all. Given that Bloodstone is my favorite D&D adventure series and Birthright my favorite campaign, I am all kinds of interested. And really want to know more about this project. Hmmm . . . will have to wait till I get home to see these rules, but definately might be worth integrating into Kalamar. Long time in the future, but I'd like to have it out there. Woo hoo, steamships! Can't wait. Great announcement! I can't wait for look at this! The Colony Game, Power Game, Long Game. Why not just call it the Domain Game and be done with it? Deja vu. My real question though was more about how your game stacks up to ckutalik's Domain Game. I was an early player in his playtest game in January and he was pretty much aiming to do exactly those components too, right on down to that whole Pendragon biz. I was not trying to sound snarky, but I was curious what you thinking were the differences. For those looking for inspiration for an AGG game, look no further than George R. R. Martin and his "Game of Thrones" series of books. You'll get dizzy trying to keep track of the double-, triple-, quadruple-, etc. crosses, the ever shifting alliances, unspeakable treacheries, and so forth. It is interesting how the Wheel of Fortune (in the Mediaeval sense) turns, with one faction rising to pinnacles of power, only to be cast down and ruined at some point later. For real world inspiration, study the Wars of the Roses, or certain families such as the Medici. For television there is of course the Showtime production of Game of Thrones. They also did a series called The Tudors, focusing on the infamous King Henry VIII. Very interesting to watch how certain people rise to great power and favour, only to end up losing their heads on a chopping block.